Right let's summarise first: It's a speedometer app, it's accurate in measuring your speed, it looks good with a minimalist interface and it's simplicity itself to use. And that applovers is what SpeedGlow Speedometer app is all about. I got the summary out of the way first because I really wanted to wax lyrical on one of the speedo apps best features: The HUD. Ever since I heard of Heads Up Displays on top end luxury vehicles like BMWs and Audis I've wanted one. However the app reviewing business isn't multimillion dollar enough to afford a car HUD yet! 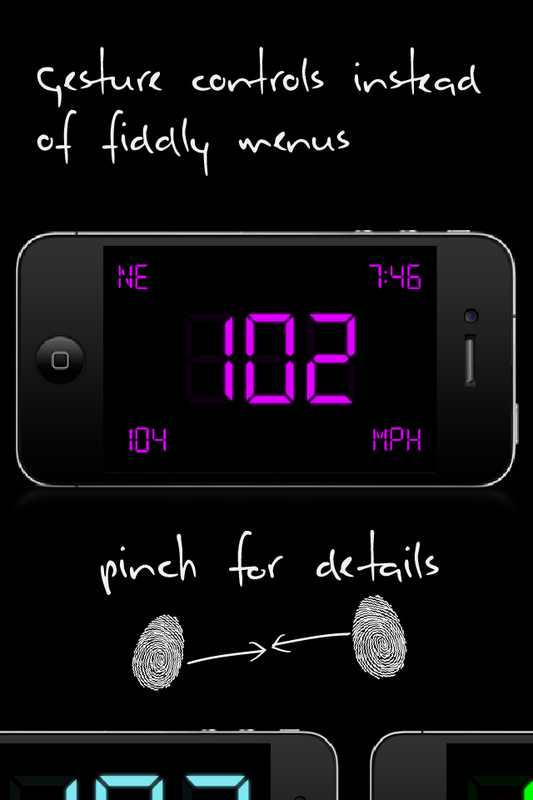 But guess what SpeedGlow is a HUD app for your car too! With simple mirroring you place your iDevice on the car's dashboard and it reflects on to the windscreen: instant HUD! That feature alone is worth the price of entry but of course is not the entirety of the speed measuring application. As I mentioned earlier the interface is great, it dispenses with superfluous information and just gives you the basics necessary to measure your car's speed. The touch interface is very well thought out too, with colour changes, HUD up and speed limit setting all from simple gestures. Of course for serious utility app users you'll be wanting to get an indispensable function from your app, aside from everything else the app measures speed accurately and can be used to warn you when you approach your defined limit. Of course if you're a racer the function that records the top speed reached is also useful. In our test we measured the apps velocity measuring with 2 Satnavs, the Satnavs use the same GPS type measuring as the app and the fact that all three tallied with the car speedometer itself registering 5 mph less than our 60 mph just shows this apps usefulness. 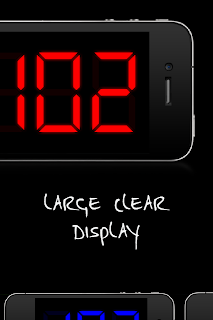 So if you want a well designed speedometer app that will give you a true indication of your speed then SpeedGlow needs to be installed on your iDevice. 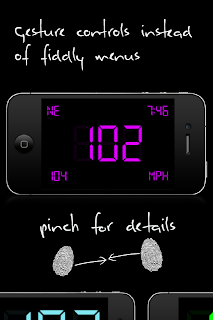 And did we mention that it's the cheapest and best vehicle HUD too!